From getting up early to help with our weekday morning routine, to always being available for ‘at-a-moment’s-notice’ babysitting, and even putting up with us having taken over their garage to store our belongings, my parents have opened their home to us asking little more than a tiny contribution to the grocery bill. So when the time came for us to decide on our first PARA Blog Crew project, we thought it might be time to give back. So for Christmas this year, we’re giving their house a bit of a facelift. 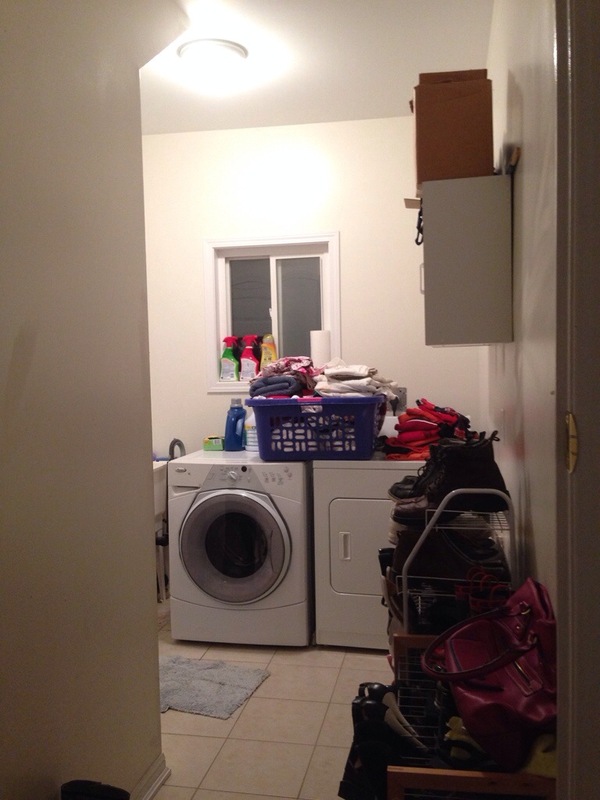 With 4 adults and a pre-schooler in the house, the laundry room is definitely an area that gets a lot of traffic. It also happens to be the only room in the house that after 7 years is still ‘builder beige.’ But beyond the aesthetics of paint, the function of the laundry room as is, leaves much to be desired. 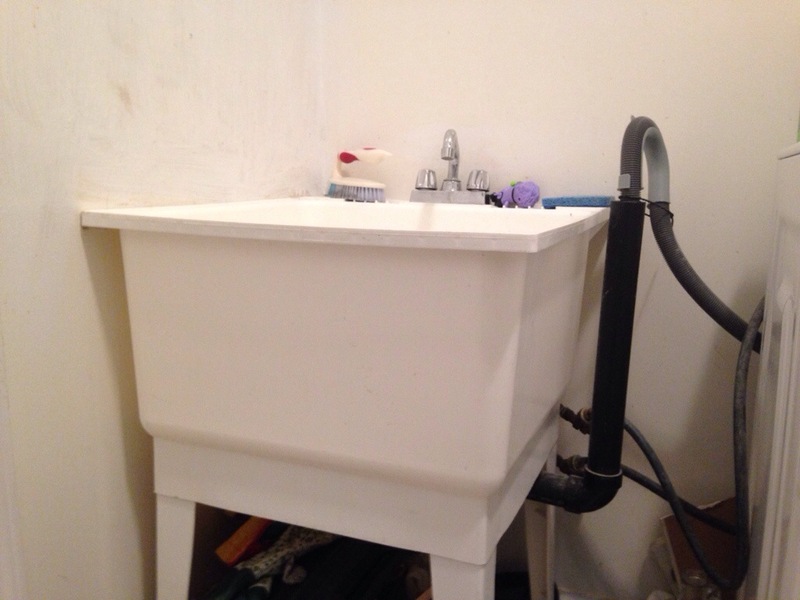 Laundry basin – it sits unlevel, and therefore doesn’t drain properly. There’s also no backsplash on the surrounding wall which can be a bit problematic when you’re trying to clean muddy boots in the sink and the faucet seems to go from gentle trickle to fire hose with the slightest touch. Work surface – there isn’t one. Unless you count the top of the washing machine & dryer which have become the home for everything from cleaning supplies, to clothes waiting to be folded. Storage – again, relatively non-existant. The small wall-mounted cabinet that was originally supposed to house the laundry supplies, has since deteriorated to a cross between cat food storage for me & a place where random things go to die. There’s no place to hang clothes. And because the laundry room also doubles as the garage entrance to the house, it’s become a place to store shoes, knapsacks & other things that my mom doesn’t want to clutter up the front door entrance. We’ll be taking you all the way through the DIY in a series of posts over the next couple of weeks leading up to the final reveal just in time for Christmas. Be sure to also follow along with us for some behind the scenes pics using #ProjectSanta on Twitter and Instagram! My laundry room is small, but somewhat organized. I’d love to give it a fresh coat of paint and add a little personality in the new year. Good luck with all your plans! It’s going to be so much nicer to do laundry in! Thanks so much Shauna! It’ll a much nicer space for sure! I’m one of those lucky girls who’s hubby does the majority of the laundry though, so I won’t be as much of one to benefit from it. 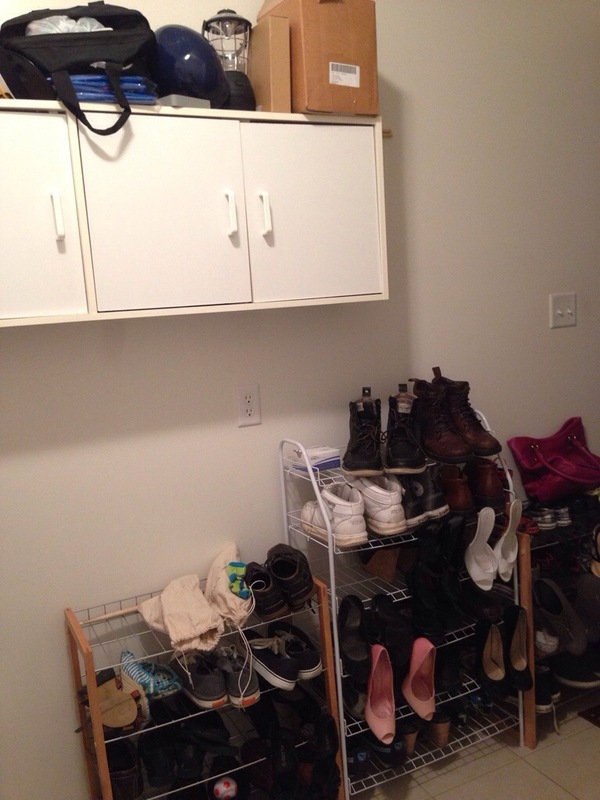 Except maybe the shoe storage! 😉 Good luck with your projects in the new year as well! I think it’ll look great!! My dad recently redid his laundry room and he found a laundry sink that was super stylish and even had storage underneath. there are definitely sinks on the market now that arent “utlity sinks”! Thanks Casey! Yea we’ve been on the hunt for a laundry sink. We found a pretty stylish one, just not sure if it is the right depth for what we’re looking for so the search continues. This is such a wonderful idea! Can’t wait to see how it turns out. Thanks Ashley! I’m really excited for my parents to see the finished product too. Oooh – Can’t wait to see what you do with the space! What a great thing to do for your parents! I’m sure they will really love the makeover. Can’t wait to see it! What a fabulous idea! Can’t wait to see the progression of the laundry room project! Thanks Sabrina! 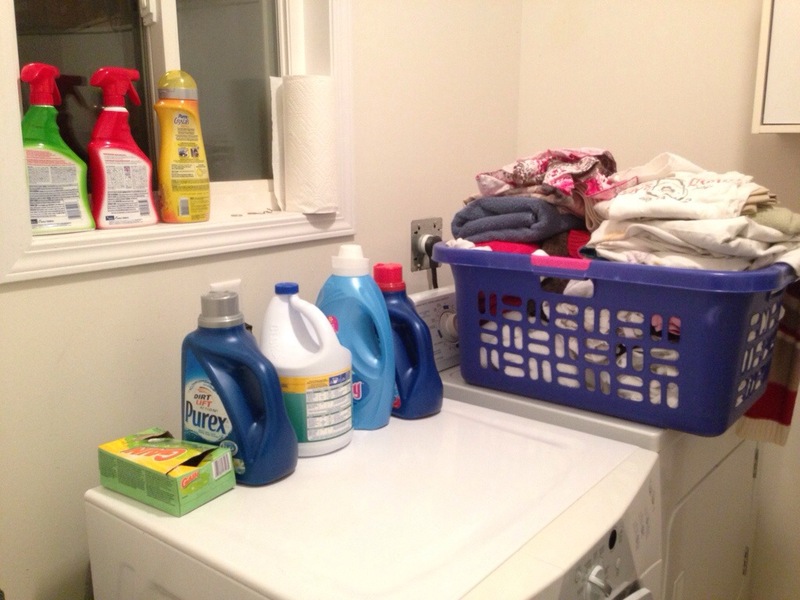 I love a well functioning laundry room! Looking forward to seeing how you tackle yours!